A-HOTEL.com - Luxury and cheap accommodation in Bakoven, South Africa. Prices and hotel, apartment booking in Bakoven and surrounding. Set high on the slopes of the Twelve Apostles Mountains, this self-catering guest house offers rooms with views of the ocean, designer furniture and a hot tub. It has an indoor pool. Ty Gwyn is located in Cape Town, 5 km from Table Mountain, 6 km from Long Street, as well as 10 km from V&A Waterfront. Complimentary WiFi is featured. Set in Cape Town, 5 km from Table Mountain and 6 km from Long Street, Hoopoe Haven features accommodation with free WiFi, air conditioning, a garden and a shared lounge. This property is 10 km from V&A Waterfront. Set in a beautiful tropical garden, Cape Rose Cottage offers well-appointed accommodation in Camps Bay. There is a private pool and large terrace with views of the ocean and surrounding mountains. Set in Cape Town, 5 km from Table Mountain and 6 km from Long Street, Camps Bay Villa Sleeps 10 Pool Air Con WiFi offers air conditioning. 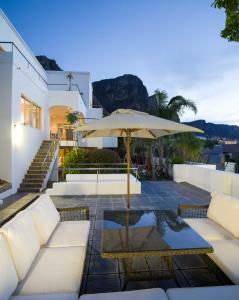 Free WiFi is available in this villa, located 10 km from V&A Waterfront and 12 km from CTICC. 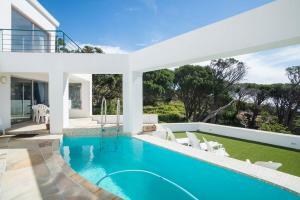 Featuring free WiFi and a balcony, Villa Grenache is a villa located in Cape Town, 2.6 km from Camps Bay Beach. Located 5 km from Table Mountain, 7 km from Long Street and 10 km from V&A Waterfront, Camps Bay Speciality Sleeps 6 Air Con WiFi offers accommodation situated in Cape Town. This property is 13 km from CTICC and features free WiFi. Offering views of the ocean and the Twelve Apostles mountain range, The Falcon boasts 3 bedrooms and a deck with infinity pool. Camps Bay Beach is 5 minutes' drive away. Featuring barbecue facilities and a terrace, Cape Gray - View 1 is situated in the Camps Bay district of Cape Town, only 5 km from Table Mountain. This property is 6 km from Long Street and features free WiFi. Located in Cape Town, just 5 km from Table Mountain, Cape Gray - View 2 provides accommodation with free WiFi. The property is 6 km from Long Street and 10 km from V&A Waterfront. Located 5 km from Table Mountain, 6 km from Long Street and 10 km from V&A Waterfront, Camps Bay Apartment Sleeps 2 features accommodation set in Cape Town. The accommodation is 12 km from the CTICC. Offering sea views, Camps Bay Apartment Sleeps 4 Air Con is an accommodation located in Cape Town, 5 km from Table Mountain and 6 km from Long Street. The V&A Waterfront is within 10 km of the apartment. Nestled at the foothills of the Twelve Apostles Mountain range, Auberge du Cap in Camps Bay offers stunning views over the Atlantic Ocean. The guest house has a sun deck with outdoor pool. Camps Bay Villa Sleeps 12 Pool Air Con is an accommodation located in Cape Town, 5 km from Table Mountain and 7 km from Long Street. The property is 10 km from V&A Waterfront and 13 km from CTICC. Located in the Camps Bay district in Cape Town, Kettle’s House features a swimming pool, free WiFi and private parking is available on-site. Table Mountain is 5. The Views is situated in the Camps Bay district of Cape Town, 5 km from Table Mountain, 7 km from Long Street and 10 km from V&A Waterfront. Guests are welcome to enjoy the free WiFi. Located above Camps Bay on the slopes of the Twelve Apostles Mountains, Bayview Penthouses features spacious, self-catering accommodation with air conditioning. There is also an outdoor pool. Penelope at Funkey 4B offers accommodation in Cape Town, 5 km from Table Mountain and 6 km from Long Street. It is located 10 km from V&A Waterfront and offers luggage storage space. Located in Cape Town in the Western Cape region, 7th Heaven by Totalstay has a balcony. The property features sea and pool views. Situated in Cape Town, within 5 km of Table Mountain, The Upper House offers accommodation with free WiFi, air conditioning and barbecue facilities. This villa is 6 km from Long Street and 9 km from V&A Waterfront.